He's known as Mad King Ludwig, but that's not really fair, and I personally prefer his other monikers like the Swan King, the Fairy Tale King, or just plain King of Bavaria. Sure, he was eccentric, but weren't/aren't most kings and queens a bit peculiar? 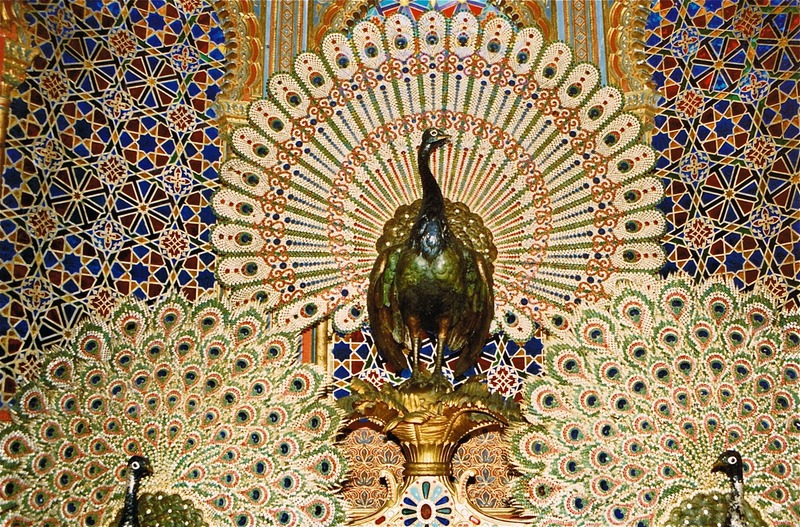 King Ludwig II of Bavaria was not prepared to rule when he ascended the throne at the young age of 18, and never fully embraced his governmental duties; rather he preferred art, theater, Richard Wagner's operas, and fantasy. And it is thanks to these creative desires, extravagant vision, and Ludwig's own personal fortune that we today enjoy three magnificent castles in Germany that he designed and built during his brief life: Neuschwanstein, Linderhof, and Herrenchiemsee. 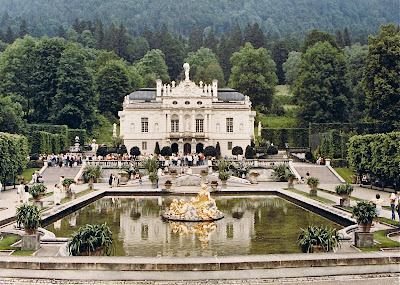 If your children are very young, I highly recommend visiting Linderhof Castle in Ettal, Germany. It is the smallest of the three palaces and much less crowded than Neuschwanstein, but the appeal for families is definitely the palace gardens. 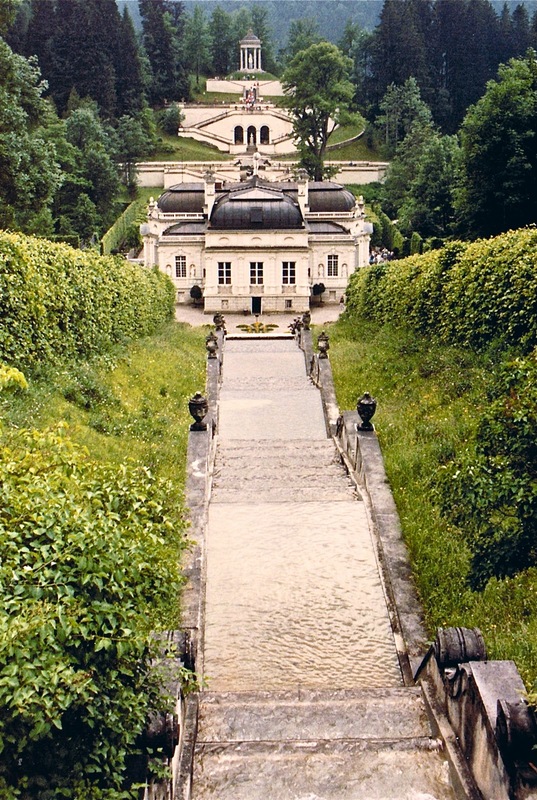 In his attempt to recreate the grounds of the Palace of Versailles, King Ludwig designed what is today considered one of the most beautiful mixed landscape formal garden parks, covering a total area of approximately 125 acres. The splendor of this palace and garden complex is breathtaking. Your young children will be delighted when you suggest a treasure hunt to locate Ludwig's numerous pavilions, fountains, kiosks, sculptures, ponds, temples, houses and huts scattered throughout the estate. 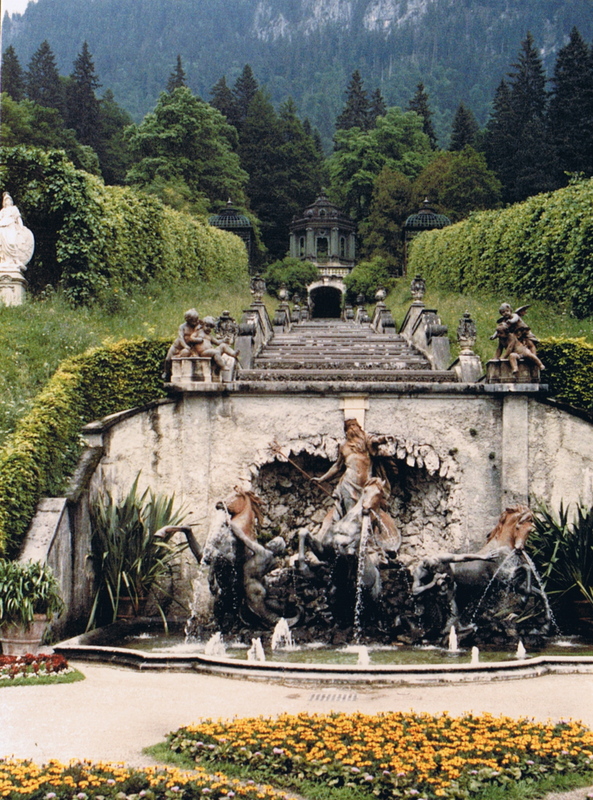 You might want to start to the north of the palace at the powerful Neptune fountain and then continue up the cascade of thirty marble steps to the large wooden Music Pavilion. 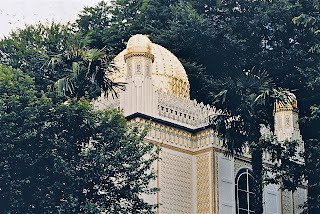 From there, following the wooded paths will lead you to the Venus Grotto, the Moroccan House, the Royal Lodge, and the Moorish Kiosk. 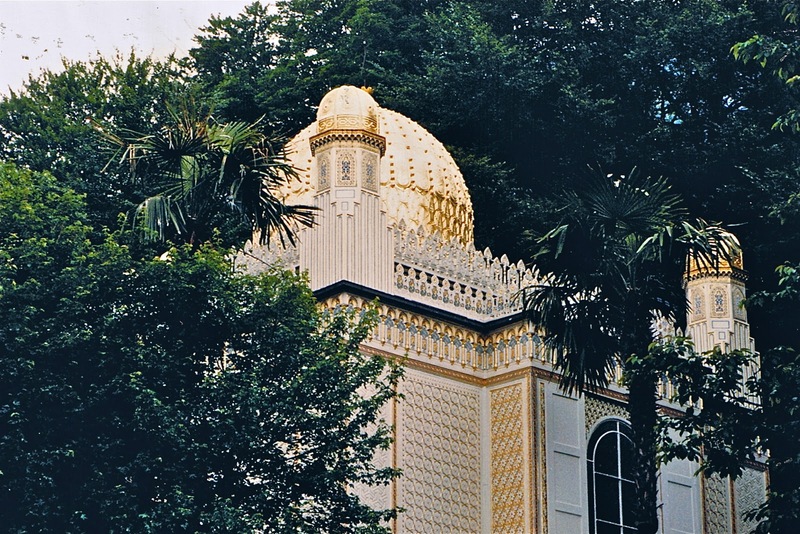 King Ludwig had a fascination for the Orient, French royalty, and mysticism, and many of the architectural features in the gardens reflect these tastes. Perhaps one of the most eccentric ideas he implemented at any of his three residences is the Venus Grotto at Linderhof, a completely artificial dripstone cave with an interior lake and waterfall. 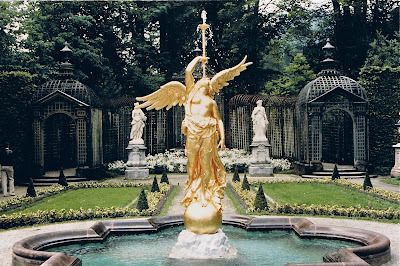 He modeled the grotto after a scene in one of Richard Wagner's operas and enjoyed being rowed around the underground lake in his golden swan-boat. 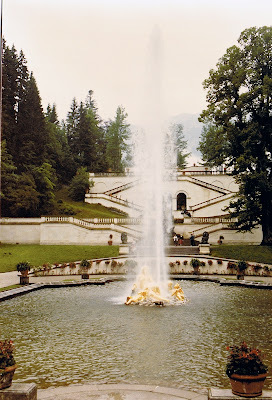 As a child myself this "secret hide-out" was always my favorite place to visit at Linderhof. Your child might be challenged to count golden statues at Linderhof, starting at one with Flora and her attendees in front of the palace and continuing with the gilded angel in the Western Parterre. There are many, many more. Linderhof Castle is an easy day trip from Munich, and both a train trip or a car ride to this spectacular destination are very scenic. By car, you will travel through Garmisch-Partenkirchen, a lovely alpine town, and by train you will disembark in Oberammergau, a charming little woodcarver's village. From Oberammergau a bus will take you to Linderhof. 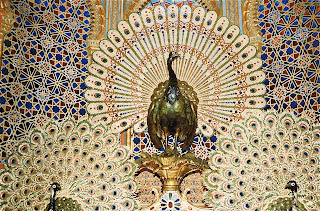 Visits inside the palace are only available with a guided tour and English tours are available. Admission is €8.50 for adults and €7.50 for children, and entrance to some of the garden buildings are an extra fee. In the winter the palace can be toured, but the grounds are closed. Every time I read one of your posts I find another place that I want to go in Europe! But at this second we call it a a success day if undergo is not extra than minutes past due to high school and https://www.gethomeworkonline.com/ that i take into account to head pick out him up. At the end of the day although I examine my boys and my heart looks like it can burst. 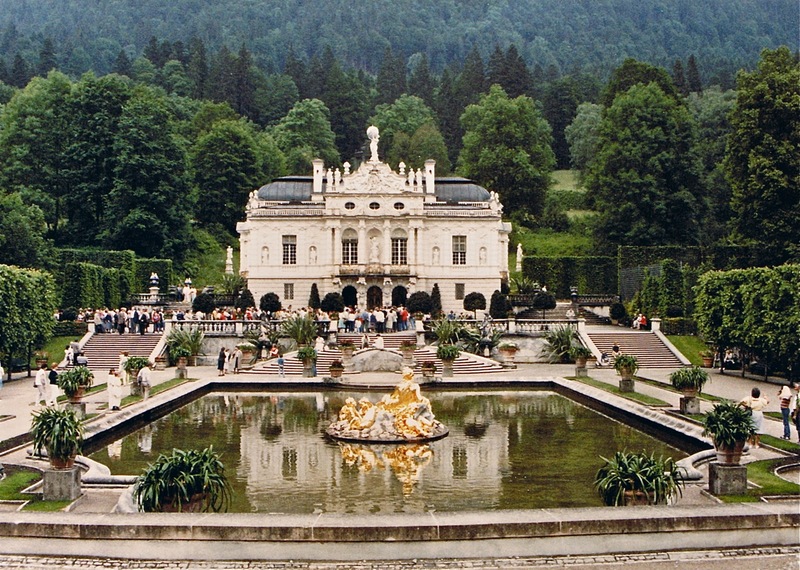 I've visited Neuschanstein and the Chiemsee, but haven't made it to Linderhof yet, but it looks amazing. King Ludwig II definitely built memorable castles. I just saw your post, and it reminded me of my study abroad summer in college! I visted all of these breathtaking places! What wonderful memories!